American unemployment rate is at a five year high. 6.1 % of Americans are unemployed -- that's 9.4 million people without jobs. 2.2 million Americans have lost their job in the last 12 months. 592,000 Americans lost their job in August 2008. The following is an excerpt from Bill Moyers PBS show, Bill Moyers Journal. 50 Million American children went back to school this month. More of them are homeless, and poor enough to need free meals. Mortgage foreclosures are throwing 100's of families out of their homes each month. With fuel and food costs rising - with tax revenues falling - school budgets are in retreat. Detroit for example has laid off 700 teachers. We're not talking about a few isolated places -- this is nationwide. Across the country schools are shortening the school week --eliminating or cutting bus services altogether. Canceling field trips, and hiking the prices of cafeteria lunches. The whereabouts of Vice President Cheney -- he is in Central Asia -- the crossroads for oil in the Caspian Sea. No sooner had he landed in one of the former Soviet Republics -- he met with two giant oil companies - B.P. and Chevron. Meanwhile back in Washington -- the Bush Administration was announcing an increase in American aide to Georgia by more than fifteen hundred percent. That is from sixty four million this year -- to one billion next year. You can only wonder how many American kids that money could put back on the buses -- back in the class -- and back in line at the cafeteria. 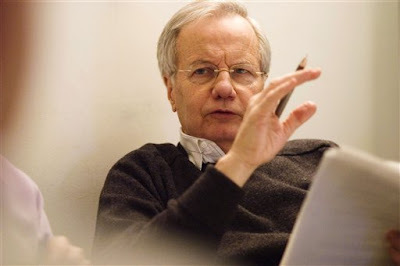 Thank you Bill Moyers for your amazing, insightful news program!!! Wow, this is great information! Thank goodness I am reading your other post (the one with the wonderful babies which appears on my google reader but not here yet.) to keep my morale up. What insanity are we going through. And the thought of so many people more than eager to vote again for the same monsters who have neglected them so. That's mind boggling to me. I accidentally posted tomorrow's post today -- so it showed briefly, and will return Thursday morning. So you got a little sneak peek. We are as baffled as you with regard to any American who would vote for more of what we've had over the last 8 years! !